Three winning pianists will perform Mozart, Schumann, Ravel with the MSO. John Schindler, Aristo Sham and Angie Zhang. The Milwaukee Symphony Orchestra will play three great piano concertos on one program at the Sharon Lynn Wilson Center on Wednesday evening. The three – Mozart‘s Piano Concerto No. 24 in C minor, K921, Robert Schumann‘s Concerto in A minor, Op. 54 and Maurice Ravel‘s Concerto in G major – cap the biennial PianoArts North American Piano Competition and Festival. The complete concertos will be played in the final stage of the competition, with the new Piano Arts competition finalists as soloists. And what works they are: Mozart’s concerto sparkles in spite of its dark C minor moments. Schumann’s concerto represents an encoded tribute to his wife. “Perhaps the most romantic of all romantic concertos,” one contestant called it. The Ravel concerto contains jazz riffs being explored by 1920’s Parisian composers influenced by American trends. Three finalists were chosen Monday from a field of nine semi-finalists who live or study around the United States and Canada. This biennial contained an exceptionally strong field. The contestants, aged 16-20, have all mastered the most difficult works of the piano repertory and look forward to professional careers as they complete their studies. The differences between the finalists came down to nuanced challenges: management of a delicate Chopin Nocturne, collaboration with a chamber music partner and an orchestra and a capacity to talk with an audience about a work they have chosen. This last point is unique among competitions. Some competitors were clearly uncomfortable with that assignment. Ensemble work is also not common in competitions. Milwaukee Symphony Orchestra artists with extensive chamber music experience worked with each semi-finalist. Additionally, several coaches were available to help with speaking about music, mental preparation and performance preparation. The semi-finals created a challenging environment. A panel of three judges were arrayed at the back of the audience. Three peer judges composed a second “Junior Jury.” Photographers and videographers captured the event. For the second round, a string player participated as a sonata partner and a second piano stood in for the orchestra for the concerto preliminaries. The two rounds of 45-minutes each are likely to be accessible on YouTube in the future. John Schindler, the only semi-finalist from the Midwest, may be familiar to local audiences. He has been a student at Hartland High School and is attending the Music Institute of Chicago Academy. Among other works, Schindler choose a selection from Ravel’s Gaspard du Nuit – Scarbo – which is considered one of the most difficult solo piano pieces in the standard repertoire. He has already performed with the Milwaukee Symphony – as a Wisconsin Youth Piano competition winner in 2013. And he has participated in Milwaukee Youth Symphony events. Aristo Sham, piano with Scott Tisdel, cello. Photo by Michael Barndt. Aristo Sham, pursuing joint degrees at Harvard and the New England Conservatory of Music, demonstrated a clear distinction between classical and romantic forms by playing an early Mozart sonata with brilliant detachment and a late Brahms cello/piano sonata with warmth and passion. Adrien Zitoun‘s singing cello lines added to the warmth. While studying in England, Sham had the opportunity on several occasions to perform for the Royal family. Angie Zhang, a junior at Julliard, demonstrated complete comfort with ensemble playing as she worked with violinist Dylana Leung in a Beethoven Sonata and Kirsten Ihde in a piano reduction of a Mozart Concerto. She is the Julliard Student Council president and was clearly comfortable talking with the audience. The three judges, Joseph Kalichstein, Ursula Oppens, and Peter Takács, each renowned pianists and teachers, will participate in a “Masters” concert collaborating with four Milwaukee Symphony Orchestra players (Benjamin Adler, Susan Babini, Ilana Setapen and Scott Tisdel) this Tuesday evening at 7:30 p.m. at the Wisconsin Conservatory of Music. The final events move to the Sharon Lynne Wilson Center for the Arts, 19805 W. Capitol Drive, on Wednesday night. Semi-finalists reprise the competition with short piano solos at 6:00 p.m. and three finalists perform the concertos with the Milwaukee Symphony Orchestra at 7:30 p.m. Andrews Sill, PianoArts Music Director, will conduct. The three concertos will also be previewed by Meaghan Heinrich in a 5:15 p.m. pretalk. Tickets are $30 for adults, $15 for students and available online by phone (262-781-9520) or at the door. Milwaukee continues to benefit after the end of the competition. Contestants are invited back to participate in community concerts and school outreach programs. The relationship often continues for many years. 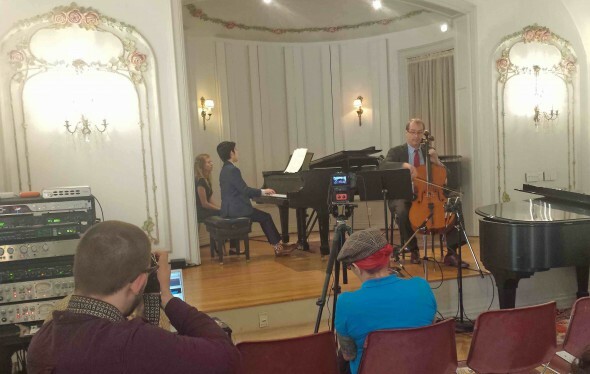 In the last two years three prior participants returned as PianoArts Fellows, two others served as Artists in Residence and the 2014 winner, Carmen Knoll, returned for a well-received performance as a headliner at the Sharon Lynn Wilson Center. Founder and leader of PianoArts, Sue Medford, is particularly proud of the role PianoArts plays in the development of young artists – both the careers of PianoArts alumni and the youth reached in Milwaukee through the PianoArts outreach programs. I saw David (from Korea) play so magnificently for an audience at St. John’s On The Lake. How can we find out the who won the competitions?